Is it Solitude or Isolation? "A lot of people in recovery are introverted, so we need alone time." Many of us are introverted individuals living in an extroverted culture. Introversion and its corresponding social anxiety (and a tendency towards isolation and avoidance) are challenges, especially in early recovery, as we learn to navigate our social and personal lives without psychoactive substances. "In solitude you are redefining yourself, re-learning yourself in a new state." Isolation is often marked by a feeling of emotional emptiness, fear, and loneliness. While solitary, isolation is a depleting, harsh, deficiency state, marked by a sense of estrangement. Isolation can be self-imposed, or imposed by others. In isolation we hide, shut down, and stunt our growth. As substance use disorders progress, isolation takes over and many remain locked in crippling shame. Coming out of isolation in early recovery is a new behavior, but it is necessary for restoring emotional and physical health. Today, many options for support and social connection are available for individuals in recovery. We can choose over and again until we find the right recovery group or community for our needs. Learning how to balance solitude and time with others provides the strongest foundation for developing healthy personal boundaries and improved relationships with self and others. Solitude comes from an attitude of self love and self-acceptance; isolation is what people do when they hate themselves. Solitude increases our self awareness and creates room for us to begin to trust ourselves and others. Solitude can provide a pause button for us to consider what we are learning from the recovery community. It helps us develop inner richness, gratitude, and a broader perspective. Alone time also helps creativity. Solitude can be found anywhere, but many find that solitude is most energizing in nature. When we remove ourselves from the distractions, constraints, and opinions of others, solitude frees us to listen to ourselves, and find stillness. The stillness we cultivate in solitude has a ripple effect in our lives and the lives of others. May we all come to solitude, so that we may evolve further and bring our best selves to the world. There is a growing body of empirical data that supports yoga as an ancillary treatment for recovery from mental health conditions. One of the greatest potentials of hot yoga is its ability to alleviate the symptoms of Post Acute Withdrawal Syndrome. 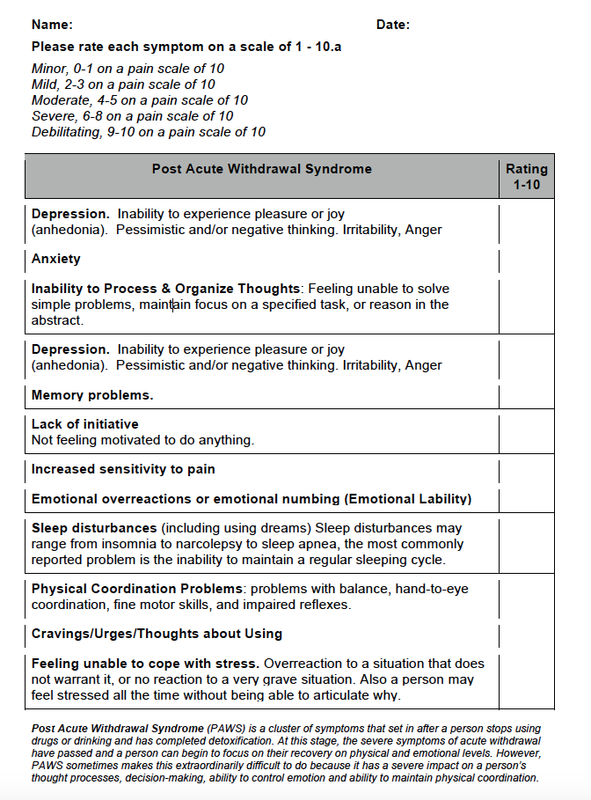 Post acute withdrawal syndrome refers to a cluster of abstinence-based symptoms that set in after a person in early recovery from a substance use disorder (or SUD) has completed acute physical detoxification. PAW can last from weeks to several months, depending on the extent of progression and substances used. PAW makes early recovery difficult to maintain because it is fraught with physical, emotional, and mental disturbances as the brain re-adjusts to a new state of equilibrium. Depression includes an inability to experience pleasure or joy (anhedonia); pessimistic and/or negative thinking; irritability; and anger. During an informal “Sober Yogis Challenge” study at Blaze Yoga and Pilates and Steamhouse Yoga and Pilates, participants reported a two-thirds reduction of depression symptoms on the Beck Depression Inventory. Those who saw the greatest symptom reduction practiced more frequently. Hyperthermia has been studied since the 1970’s for its positive effects on depression. Saunas have been used for centuries in northern climates to reduce the impact of seasonal depression. Common cultural wisdom has been validated by scientific research in regards to the association between heating up the body and reducing the symptoms associated with depression. Limitations of current antidepressants highlight the need to identify novel treatments, such as hot yoga, for major depressive disorder. A prior open trial found that a single session of (WBH) Whole body hyperthermia holds promise as a safe, rapid-acting antidepressant modality with a prolonged therapeutic benefit. Future studies will be conducted to identify both the optimal temperature, number and timing of treatments likely to produce the largest and longest-lasting clinical response among patients. In hot yoga, we like it and keep it hot! For the full article published in the Journal of the American Medical Association, click here. Yoga trains the body, through focused breath work. This activates the parasympathetic nervous system, thereby decreasing anxiety. During an informal study at Blaze Yoga and Pilates and Steam House Yoga and Pilates participants in early recovery involved in an 8 week hot yoga challenge reported a 67% average reduction in anxiety on the Beck Depression Inventory. Sleep disturbances in recovery include using dreams and may range from insomnia to narcolepsy to sleep apnea. The most commonly reported problem is the inability to maintain a regular sleeping cycle. Individuals may wake several times during the night and they may not feel rested after sleep. Because yoga decreases tension and anxiety, it improves the capacity for restful sleep. Deep breathing techniques, savasana, and restorative postures in yoga strengthen the vagus nerve and decrease activation of the sympathetic nervous system, allowing the practitioner to fall asleep more easily. In one study, individuals who practiced 45 minutes of yoga three times a week for twelve weeks saw an average 31% reduction in the “stress hormone”, cortisol. Click here for more. Inability to Process & Organize Thoughts. In early recovery people often feel unable to solve simple problems, maintain focus on a specified task, or reason in the abstract. PAWS causes people to have difficulty remembering what they learn and understand. Memories can fade and it may feel like they are not moving fluidly from short-term memory to long-term memory. Practitioners engage in breathing exercises that require rhythmic breathing in a group setting. Clinical studies on rhythm therapy utilizing this method of breathing show improvements in short term memory and facial recognition. Yoga creates a sense of wellness and self-acceptance. By making a commitment to, and participating regularly in challenging yoga classes, individuals in early recovery experiencing PAWS start to “do” what they mistakenly believed they could not. This generates further motivation to confront a painful and negative self-concept that developed as part of the substance use disorder. With a regular yoga practice, self-loathing is peeled away and replaced with a sense of accomplishment and a more positive self-concept. Yoga improves the practitioner’s self-awareness of the present moment. This increases proprioception and assists in the development of a more regulated experience of pain and injury. It also trains the practitioner to relax into a disturbance, rather than avoid it. Over time, this changes how one conceptualizes and experiences pain. Yoga decreases inflammation, and as such, reduces the pain associated with arthritis, rheumatoid arthritis, fibromyalgia, and other autoimmune diseases. Studies on fibromyalgia and yoga have shown more than a 50% reduction in perceived pain after initiating a yoga practice. Yoga improves joint mobility, muscle strength and flexibility, skeletal alignment, and increases overall health. Click here to see Dr. Rhonda Patrick and Joe Rogan: hot yoga vs. “exercise” for inflammation. Emotional Overreactions or Emotional Numbing. A newly recovering person may experience overreactions to situations that are benign, or have no reaction to very grave situations. This response, due to a dysregulated sympathetic system (fight/flight/freeze), is common for those in early recovery and also for those who suffer from PTSD. Many individuals in recovery also report trauma histories, and emotional overreactions and emotional numbing are also symptoms of PTSD. People with PTSD and SUDs often feel unsafe in safe situations. And people in recovery from SUDs and PTSD often do not have a sense of personal agency, or choice. This makes it difficult to feel comfortable in and in control of one’s body. For yogis who have long suppressed emotions, accessing them through the body is sometimes the only way to “metabolize” and “release” these “stuck” emotions. This is a gentle way to release “content” without having it connected to “story,” memory, experience, or self-image. During the informal Sober Yogis study at Blaze Yoga and Pilates and Steam House Yoga and Pilates, participants reported an average reduction from “severe to mild” in symptoms associated with emotional lability with frequency and length of practice. Greater gains in symptom reduction were made by increasing the frequency of practice. 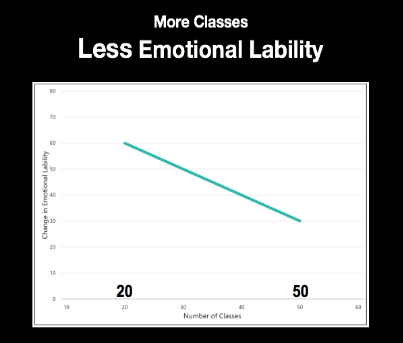 The decrease in emotional lability that was reported during the Sober Yogis Challenge is seemingly typical. At the Justice Resource Institute, a reduction in symptoms of PTSD has been formally documented in a large study on Trauma Sensitive Yoga funded by the Substance Abuse and Mental Health Administration. Those who practiced yoga more frequently saw more robust symptom reduction and a number of participants lost all of their symptoms (and diagnosis) by the end of the 10 week study. It is common to experience problems with balance, hand-to-eye coordination, fine motor skills, and impaired reflexes during early recovery. Yoga postures begin by directing awareness to the breath and the body as a whole, and then move to more focused attention on specific areas. This allows practitioners to slowly introduce physical movement with depth and control. The therapeutic practice of yoga improves coordination, balance, strength, flexibility, range of motion, joint health, circulation, and fine and gross motor skills. Feeling Unable to Cope with Stress. A low level of stress can cause an exaggerated reaction in the brain and nervous system during early recovery. A person also might feel stressed all the time without being able to articulate why. The combination of damage to the nervous system caused by alcohol or drugs and the psychosocial stress of coping with life without drugs or alcohol can be overwhelming. Yoga encourages the development of a healthy ego, the ability to see one’s self through the lens of the present moment, and see one’s self as evolving through all of life’s experience over time. Yoga provides community. Individuals with social connections are not only healthier, but also cope with stress more easily. For more on the importance of social connections in early recovery, click here. Craving is a natural physiological response to substance use, and it usually continues on and off well after substance use stops, and any physical withdrawal from substances is complete. Craving is a desire for the substance that has been withdrawn. Cravings typically last from 5 to 30 minutes. They are one of the most frequent causes of relapse, even after long periods of abstinence. Yoga helps to regulate and stabilize blood sugar and blood pressure (stress response), two factors involved in producing cravings. Many individuals in early recovery find it useful to rate PAW symptoms on a weekly basis. With a regular yoga practice, one can reduce the the impact of PAW. People who rate symptoms on a scale of 1 - 10, notice that some symptoms are alleviated quickly; while others linger and then disappear; while some may appear out of the blue, seemingly without warning. It’s important to observe, breathe, and lean into what you notice, rather than panic or avoid exploring the discomfort. Remember: PAW will be experienced differently by everyone. PAW is a natural and temporary aspect of healing from a SUD. Avoidance of distress is what kindled the SUD in the first place. Some discomfort will most assuredly be a part of any healing process, and brain changes during early recovery are disagreeable. In yoga we move, sweat, breathe, and, “get comfortable feeling uncomfortable.” During the process we create a positive and sustainable change and increase health and wellness. Many find it helpful to rate PAW on a scale of 1-10, weekly or monthly. Over a period of time PAW may improve (regenerative PAW); may get worse (degenerative PAW); stay the same (stable PAW), or it may come and go (intermittent PAW). Information is power and protection against relapse. If symptoms are high, get to your yoga mat for some symptom relief. The hardest part of recovering from an SUD is clearing toxins, both physical and emotional. In Hot Hatha Yoga, the body releases toxins and sweats out impurities. The more you sweat, the more toxins will be cleared. The liver, kidneys, lungs, and excretory organs are the most responsible for clearing toxins from the body. The skin is the largest organ in the body, and it is our skin that excretes sweat. Sweat is comprised of water and several important minerals, and studies have also shown that sweat contains heavy metals, fat soluble toxins, and urea in the same concentrations found in human urine. While sweat may not be a primary mover of wastes in the body, it does have the potential to reduce the detoxification burden on the liver. This is good news, as liver damage is very common for individuals with SUDs. Exercising in a heated environment causes immediate and complete vasodilation throughout the body. This process improves the ease with which the body can transport blood, waste, nutrients, and biochemicals, thereby increasing the speed of recovery and healing. If we support the body by increasing circulation, we simultaneously decrease the severity and duration of symptoms associated with PAW for those with SUDs. It feels good to move your body. It feels good to sweat. Completing a full-body workout like we do in Hot Yoga lends a sense of accomplishment and pride. Through a regular practice, we can rebuild our minds and bodies and set a solid foundation on which to build a new and satisfying life. Click for Sober Yogis Media. Thank you, Sara and Jaylon Curry, Co-owners of Blaze Yoga and Hot Pilates for conceptualizing this program, and making it possible. Special thanks to Emily McIsaac, Steam House Yoga and Pilates, who implemented this program within months of opening her studio; to Pure Action/Yoga is Medicine for giving us a format to present the findings; to Ozgur Akbas, LMFT for compiling and organizing the findings; to Kevin Hall for help with design; and most especially to all the Sober Yogis who inspire us everyday with their stories of courage and hope from the mat. 7 Challenges in Recovery & What We Can Do. Self-Pity, Self Avoidance and Passivity. "Why me? Cure me! Fix me; don't change me!" Many people in early recovery have a difficult time with the recommendation of total abstinence. If, for instance, they have gotten into trouble with alcohol, but not with pot, they conclude that they should only abstain from alcohol. This is not a sound conclusion for a number of reasons. If we want to recovery fully and become enlightened, the best decision is to abstain from all other drugs (and alcohol). i. Using anything else (that is not part of a prescribed addiction recovery program i.g. anti-depressant or other psychopharmacology) will set off urges to use the drug of choice. ii. Using other drugs to cope with life got us addicted in the first place. iii. Using other drugs (or consuming alcohol) will prolong cravings. iv. Relapse does not start when we pick up our drug of choice. It actually starts with our thinking. Cravings are a physical manifestation of the disease leaving the body. It is a mistake to think cravings are an indication that treatment is not working OR that you have to use in order to alleviate a craving. Instead: Short-circuit the urge. Get out of the moment by canceling the thought instead of feeding it. Turn towards something nurturing. Turn towards love rather than fear. Call someone who support,s loves you and understands the disease. Get to a meeting. Get to yoga. Go to the gym. Change the thought; change the behavior; extinguish the craving. High Risk Set Ups are people, places, or things that are associated with alcohol or drug use. Some examples might be: unhealthy relationships, old hang outs, having using paraphernalia around, including favorite beer t-shirts, or steins, wine glasses—anything one associates with using. Many people believe that they can beat this disease by themselves, by just making a simple decision not to use. What we often forget is the power of rituals, behaviors, and feelings that were driving the use. We need to bring these out into the open in order to identify high-risk set ups and stay away from them. Exercise: Construct a relapse scenario. What could arise in your life that has the potential to set you up? If you find yourself idealizing or romancing a high; cut this thought off and go to the worst possible moment you can remember while using-- times when you were physically ill or in danger of hurting yourself of someone else, or times perhaps, where you actually did did cause yourself or another harm. The old thinking pattern of “I think I’ll go to the bar and play pool and see my friends—I can handle it, besides, I’ve decided not to drink and/or use anymore and I’m starting to feel really good.” is a high risk set up we need to move away from completely. Choosing to think it is possible to be cured of this disease has led many to relapse. Recovery requires a healthy respect for the damage this disease can do, even after one has been clean a while. A decision not to use is a good first step, and remember, if a decision were all that was necessary to stop using nobody would need to read this. Protect your sobriety by not sabotaging yourself in this way. If you have a slip or relapse, it is important to put on the breaks as quickly as possible. Don’t wallow in despair, guilt and misery. Turn towards your recovery. Turn towards what is nurturing. Turn towards self-compassion. Connect to goodness and don't be afraid to call on love. Call someone who understands the disease of addiction and can help you turn yourself around. Exercise: If you slipped; what would you do? Who would you call?